Wastewater, liquid waste, and sewage are terms for "used" water and the wastes that it carries. Basically, they are terms for what is flushed down the toilet or washed down the drain. Wastewater can also include rain water, groundwater or snow melt (inflow and infiltration) that make their way into sanitary wastewater pipes. It includes fats and grease, organics, minerals and chemicals in solution/ suspension in the water. Wastewater treatment is essential to protect our water resources, the environment, and human health. Treated wastewater can also produce useable resources such as water, biosolids, heat, and electricity. Wastewater drains into a network of pipes maintained by sewer serviced municipalities and the Regional District of Nanaimo. Sewer systems are built to follow the natural slope of land, generally flowing towards the sea front. 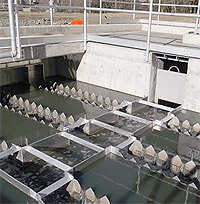 This design allows gravity to do most of the work transporting the wastewater to one of four wastewater treatment plants. For residential areas that are lower than adjacent lands or treatment plants, the wastewater must pass through a pumping station to pump the liquid into the plants. Treatment of our wastewater is an essential process that prevents contamination and destruction of our waterways, and our natural water resources. Wastewater is pumped and gravity fed into the treatment plant through the headworks, which is composed of screens and grit tanks. 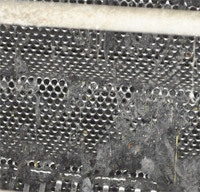 The screens remove rags, sticks, plastic and larger objects. Grit tanks settle out heavy particles like sand and stones. The screenings and grit are transported to the Regional Landfill for disposal. Following preliminary treatment, the wastewater flows into a primary settling tank where it is held for several hours allowing solid particles to settle to the bottom of the tank. Fats, oil and grease are skimmed from the tanks, dried and sent to the landfill. The settled particles, known as primary sludge, is collected and pumped to a digester or holding tanks for further treatment into into reusable biosolids. Water is removed from the biosolids, surplus water from the dewatering process is returned to the headworks. Primary treatment allows for the physical separation of solids and grease from the wastewater, and removes approximately 50% of Biological Oxygen Demand (BOD) and 60-70% of Total Suspended Solids (TSS) to produce an effluent with BOD and TSS not exceeding 130 mg/L. Chemically-enhanced Primary Treatment provides the addition of a chemical or chemicals at the primary sedimentation stage. During this step, a coagulant (e.g. alum) and flocculants (e.g. anionic polymer) are added to the effluent to enhance the settling of solids, further reducing TSS and BOD levels. 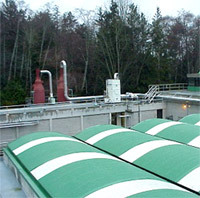 Presently, Greater Nanaimo and Nanoose Wastewater Treatment Plants provide Chemically Enhanced Primary Treatment. The final effluent after treatment is discharged to the Strait of Georgia. Following primary treatment, effluent is pumped to the secondary treatment stage where it is aerated and biologically treated. It may take one of several forms; for example, either a trickling filter (French Creek) or a sequencing batch reactor (Duke Point). The growth of micro-organisms results from the consumption of organic matter in the wastewater as their food supply. The micro-organisms create a solid organic material called secondary sludge. Secondary sludge is thickened, pumped to digesters and converted into reusable biosolids. Water is removed from the biosolids, surplus water from the dewatering process is returned to the headworks. Secondary treatment is a biological treatment process that removes up to 90 percent of BOD and TSS and produces an effluent quality with BOD and TSS not exceeding 45 mg/L. The French Creek and Duke Point Treatment Plants discharge secondary treated effluent into the Strait Georgia. Also known as advanced treatment, tertiary can use chemical, physical or biological treatment processes to remove wastewater constituents that cannot be removed by secondary treatment. Tertiary treatment can produce phosphorus levels less than 1.0 mg/L, BOD and TSS levels less than 5 mg/L, and low nitrogen levels. Tertiary treatment is typically used when there is discharge to lakes or rivers and the phosphorus levels need to be significantly reduced, or if there is a desire to reclaim effluent. Currently, no treatment plants in the RDN that use tertiary treatment. Disinfection: Secondary effluent can be disinfected using several different methods, most commonly using, ozone or ultra-violet (UV) technology before being released into the receiving environment. Duke Point further treats its final effluent with UV disinfection. Odour Control: For more information on RDN Odour Control program, visit the Odour Control page. Resource Recovery: It is possible to extract valuable resources from treated wastewater. BOD (Biochemical Oxygen Demand) is a measure of the quantity of oxygen consumed by microorganisms to break down organic matter in water. A high BOD means that there will be less oxygen; and oxygen is essential for the survival of aquatic life. Thus, high BOD levels result in the contamination of the receiving (marine) environment. TSS (Total Suspended Solids) are solid pollutants that would be captured on fine filter paper. They are visible in water and decrease water clarity. High concentrations of TSS can cause many problems for aquatic life. Click HERE for a further explanation of wastewater terms.